Kids & Bikes - Motorcycle Safety Institute of S.A.
We all love to ride motorcycles. And for those of us with children, there’s a sense of urgency to pass along our enthusiasm for two wheels. However, that passion could also pre-empt some important details that make the learning process safer and more fun. If you rush it, you could miss the opportunity to establish the good judgment and skills that could provide the foundation for a lifetime of safe riding. Even worse, without the right approach early-on, a young rider could adopt bad habits that could persist through adulthood. The bottom line, though, is something we all agree on: Riding motorcycles is one of the best pastimes on the planet. Take the time to teach your child right, and you open the door to a lifetime of fun, thrills and adventure. There are a number of academies who offer an opportunity for children aged 6 – 12 (certain conditions apply) to enroll for motorcycle rider training. With a high standard of instruction, and in a 4-hour riding session, your child will be safely introduced to the wonderful world of riding. Participation is limited to 6 riders. We emphasize safety, proper riding equipment and introduce basics such as braking, balance and throttle control through a selection of manoeuvres lined up for the session. Parents are encouraged to bring their child’s own bike and kit. This is a great way to get your child started in an activity that will bring a lifetime of enjoyment! Children must be accompanied by parents or legal guardian with authority to sign a waiver. Children must be proficient on a two wheeled bicycle. All children are different. Some are ready to ride by age three. Others won’t be comfortable on a bike until they have several years riding bicycles under their helmet. Are they really interested? 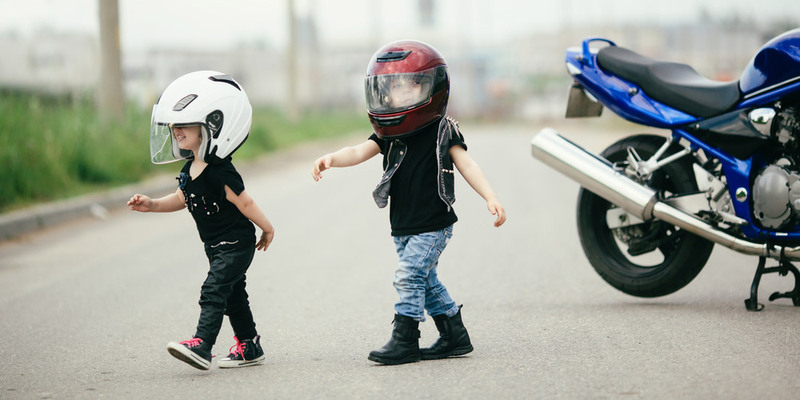 A child who makes incessant motorcycle sounds at age 3 might be ready, while a six-year old with a passing interest may not be. What you want to avoid is force riding on a child who doesn’t want it. That will only alienate them off riding. Avoidance skills. The child needs to be able to steer around obstacles, either on a bicycle or tricycle. If they can’t, don’t put them on a motorcycle. Hand strength. It’s a simple rule, and many parents overlook it. The child needs to have the strength to apply the brakes and steadily apply the throttle before they can be expected to do so reliably and safely. Patience. A child must be able to maintain the proper level of focus to operate a motorcycle. Regardless of their physical abilities, if they can’t concentrate, they won’t be able to use those abilities properly. Don’t go big. Often, parents are tempted to buy their child the next model size up than what’s right. Big mistake. If ever your child needed something easily manageable, it’s when they’re starting out. Beginners should be able to hold up the bike with both feet and comfortably reach the bars. Make sure their hands can easily reach and apply the hand controls with palms still planted on the grips. But if the size fits. Some parents will underestimate their child and get a smaller motorcycle that’s equipped with an automatic clutch. Don’t underestimate your child’s ability to learn. If your child comfortably fits on a larger bike with a manual clutch, go for it. Get the right type of bike. Childs’ bikes are just as specialized as full-sized motorcycles. A typical mistake is buying a motocross race bike when your child is going to trail ride. Get the right bike for the job, and both you and your rider will be happier. Consider used. Face it, no matter how much you love riding, there’s always a chance your child isn’t quite ready. You will be able to recoup more of your investment on resale if you start with a used motorcycle. Know what you’re getting into. If you do go used, make sure you don’t buy a lemon. If you find a good deal on a used bike and aren’t confident in your own evaluation skills, ask a friend in the know or give us a call for help. See what’s out there. There are literally dozens of kid’s bikes available. For examples of the different types of child-friendly bikes, visit a local dealer, or give us a call. You already know we teach adults the skill to operate a bike safely, and now kids. Body position. There’s one right way to sit on a motorcycle, but a lot of wrong ways. You want your head up, your shoulders relaxed, your elbows bent, your knees in toward the tank and your feet positioned on the foot pegs so they can quickly and easily operate the foot controls. Clutch operation. If they’re ready, kids large enough will be encouraged to try a motorcycle with a manual clutch. One method shows the new rider how to find what we call the clutch’s friction zone, or the point of engagement, and its proper use during riding. Getting started. The proper steps for starting a motorcycle, and that is Fuel valve, Ignition, Neutral, Engine, and Choke. Reading the terrain. Different ground conditions provide different levels of traction. By reading the terrain as early as possible, your child can see what’s coming and be ready to react long before they need to. How not to get lost. When riding out in the sticks, one can easily get lost on an unfamiliar trail. Most trail systems have excellent maps. Never set out without a map—and kids should always keep their trail guide in sight. Responsible riding. Riding responsibly is more than not hurting yourself. It’s also about not hurting the environment. Teaching integrates environmentally conscious behaviour into the training process. Riding drills. All the other stuff is great, but, face it, the children are there to ride. Drills that help teach braking, weaving, swerving and many of the other skills needed to ride a motorcycle in all types of environments. Connect, connect. Instruct from in-front. OK, you can never be 100% certain your child is paying attention, but you can be more certain if you’re in front of them instead of barking orders from behind. Get on their level—physically. We get better results when we get on our knees and speak to a child face-to-face. Don’t look down on them, and make sure they maintain eye contact. Get on their level—mentally. It is simple advice, but use plain, direct commands. Don’t tell the child to ‘accelerate.’ Tell them to ‘twist the throttle. Expect less not more from your child. Because your own children feel more at ease with you, they naturally perform with less intensity. Tone down your expectations, and they’ll often respond even better. You’ve planned, you’ve packed, you’ve driven, and you’ve parked. An hour later, you’re still fighting with junior to get his boots on the right feet and let you fasten his helmet. Sometimes, it’s the little things that make all the difference. Here are a few suggestions for avoiding some big headaches. Go over the starting drill. Even if there’s no room to ride in your backyard, there’s probably room to practice starting drills in your driveway. Learning to kick-start a motorcycle can be thoroughly frustrating. If at all possible, have them climb this mountain before they tackle all the other challenges of learning to ride. Make sure the bike works. As the parent, you’re not only the instructor, you’re the mechanic. A good time to go through your child’s motorcycle is the night before the ride. The owner’s manual includes a pre-ride checklist. Barring that, make sure you check all accessible fasteners, fluids and cables for proper operation. And it’s always a good idea to start the bike just to make sure. Get tipsy. Thankfully, most early crashes will be minor tip-overs. While your child will rarely get hurt in these little spills, their ego can become easily bruised. It doesn’t hurt to practice recovering from these little drops, as well. Go ahead and lay the bike over (drain the fuel so it doesn’t leak out), and work with your child in picking it up on their own. There’s no better way for them to recover from a bruised ego than to pick themselves back up. If possible, load up the night before. Everyone’s in a hurry to hit the road. The more you can streamline the morning loading-up process, the easier the rest of your day will be. The best way to do that is to pack as much as you can the night before. Alright, don’t expect your six-year old to perform an annual top-end teardown. But there are some things that your children can help safely maintain on their motorcycle. Air in the tyres? Checking tyre air pressure is not only safe and relatively easy, it’s important. Too much or too little air affects handling, braking and can even permit a flat. Warning: Make sure you have a pump ready before you set them loose with a pressure gauge. Spokes tight? Wobbly wheels are no fun and are dangerous. Unfortunately, many parents and children alike neglect to keep the spokes safe and tight. Be careful, though, an over-active spoke wrench can unbalance a wheel in a hurry. Keep that air filter fresh. There are an abundance of cleaners, such as dishwashing detergents with degreasers and specific commercial products that are safe for child to use. Don’t use petrol! Every bike needs oil. Again, be careful with exposure, but checking a dipstick or an oil-sight window and adding the right amount of motor oil in accordance with the procedure in the owner’s manual is safe and easy to do. Tighten that chain. A lose chain can not only cause premature sprocket wear, but it could possibly jump off and damage the engine cases or lock up the rear wheel. Fortunately, keeping the chain properly set can be done by adjusting one to three bolts, depending on the motorcycle, so it’s something that children can learn. Make sure enough slack remains to allow the suspension to work properly. How much? Check the manual. Are the knobblies enough? For optimum grip on slick terrain, dirt bike knobblies need sharp edges and deep tread. Point out these aspects to your child, and encourage them to point out to you when they think the rubber might be due for an upgrade. Watch play in the brake controls. Many kids’ bikes come with drum brakes, sometimes on both the rear and the front. That means excessive play in the brake cables can be more of an issue as the brake shoe material wears. Since your child will be the one using the bike most often, make sure they know how to recognize too much play in the brake controls. Be careful letting them adjust out that play, however. Too much tension can cause brake drag, overheating and possible loss of function. If your child’s just starting out or going for a casual trail ride, there’s no reason to gear him up like a professional motocross racer. However, if he is going to venture out on the track, it’s a good idea to supply sufficient protection. Here’s a guidelines of protection you can choose from. Go light. Everybody’s list should include a helmet and motorcycle goggles. Also, it doesn’t have to be riding gear, per se, but you also should outfit your child with long sleeves, long pants, gloves and boots. Go medium. When your child gets up to speed, they really should have the extra protection of specific motorcycle boots. The shin protection, alone, is vastly superior to even the sturdiest pair of work boots. And although riding gloves may not provide significant additional protection vs. leather gloves, for example, they are far more comfortable. Go heavy. 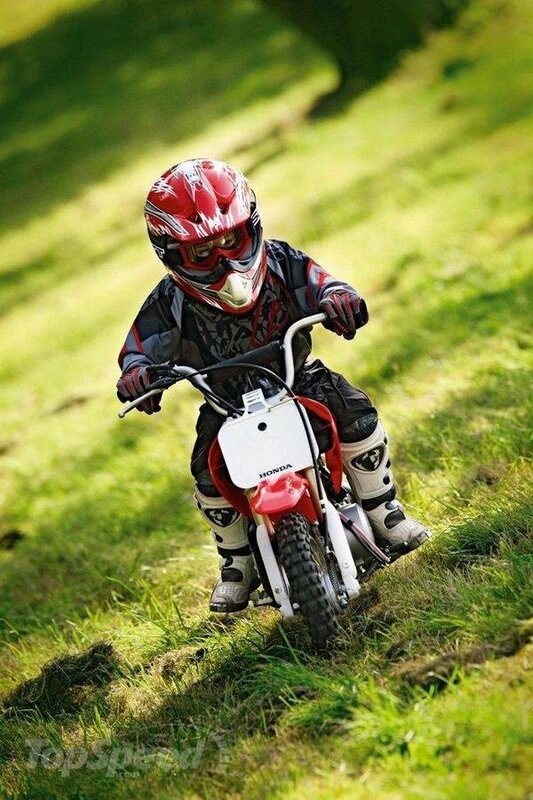 If your child decides to try racing or even practice days on the motocross track, it’s time to get serious about riding gear. At the least, you’ll want to add a proper jersey with built-in padding, kneepads, elbow pads, riding pants and a chest protector to the gear bag. All said and done – Have fun out there!